I've already given my rankings on what I think are the most important elements of the Robin Hood mythos. Now we're going to touch on other elements, primarily on the secondary characters such as the various Merry Men. It's a curious thing that while all the Robin Hood films so far have featured Robin, Marian and the Sheriff, a few versions have cut out other characters altogether. Out of the Merry Men only two have appeared in all ten of the versions for this retrospective. 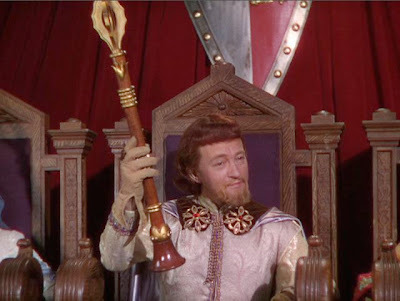 Not even monarchy is spared, as some Robin Hood films do not feature either King Richard the Lion-Heart or his villainous brother, Prince John. However, we're getting ahead of ourselves. Now, to look at the various Merry Men and Monarchs. As last time they will be ranked from best to worst and the year of their film given. 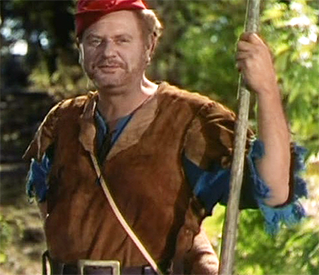 It seems a bit of a cheat to have Alan Hale be our Best Little John since he played the part not once, not twice, but three times: in the original silent Robin Hood, in The Adventures of Robin Hood and in Rogues of Sherwood Forest in 1950 which I did not watch for this retrospective. He was 30 when he first romped through Sherwood Forest, then 46, then 58: a remarkable run. However, his three-times-lucky interpretation is not what makes him the best. What gives him this honor is that he really captures the devil-may-care attitude of Little John, a rascal who enjoys a good fight and who is loyal to Robin. Williamson, while not a devil-may-care figure, at least had the loyalty part down. He played an older, more mature Little John, so one can cut him some slack when it comes to romps. Brimble edges out Harris only in that the former does look more imposing physically, and we also see him as a family man who is less interested in fighting than in defending his home. Harris is hampered by the fact he's basically playing Baloo from The Jungle Book. It was pleasant and I have nothing negative to say about it, but doing the same character in a different setting does not cut it. The others I rank only be degree of memorability. I can't remember much from Justice, Greene or Kramer, but I do remember that Durand was basically there. As for Foxx, he has many negatives against him. First, he is not Little John, but Azeem from Robin Hood: Prince of Thieves by another name. Second, he's probably the shortest Little John in film history at 5' 9". Third, he was not a major part of 2018's Robin Hood. Once he trained the 'not-Batman', he basically disappeared, popping up only when needed. The fact that he had his hand cut off was also a daft decision among many daft decisions. Another case of a slight unfairness in the rankings. James Hayter played our good Friar twice: in 1952's The Story of Robin Hood and His Merrie Men and 1967's A Challenge for Robin Hood. What elevates him beyond just his repeat appearance is that, more than any other Friar Tuck, Hayter balances the idea of the fat, jolly friar and the skilled swordsman. There is a delight, almost a cuddliness to Hayter's Friar, but he is able to be dramatic. We see this when he secretly observes the murder of his patron in A Challenge for Robin Hood. Hayter for the most part, was a delight as Friar Tuck: a mix of piety and mirth, who could rattle off quips and keep the faith equally. Pallette comes a very close second as he is an ideal Friar Tuck: rotund, with a fondness for drink and food but with faith, even if he is almost perpetually crabby and not as jolly as he could be. In a surprising turn, Tim Minchin finds himself among the better Friar Tucks and about the only real positive aspect of 2018's Robin Hood. A little too hipster in this oddball reimagining with his knit cap, at least Minchin's Friar had a personality: that of the eager but bumbling cleric. Perhaps I should knock him down for being the least religious of the various friars, but on the whole he did better than everyone else. Devine was not divine as our badger Friar, but he was probably the more compassionate when it came to tending his flock. Addy edges McShane in that I think he seemed to at least be trying and McShane's Friar just seemed to be there to show 'Christian bigotry' against the Muslim. To his credit he at least recognized when he was wrong but there wasn't much to him. Brooks' Rabbi Tuckman was a bit of Hebrew humor in the surprisingly unfunny Robin Hood: Men in Tights, and I genuinely do not remember Louis or Baker. Will Scarlet is the least disposable of our Disposable Merry Men, appearing in every version seen for this retrospective save the 1973 animated version. I think Scarlet's absence there is due to the focus of the Robin-John relationship to everything else. Why is Knowles the best Will Scarlet? I put it to the fact he is the one that stood out over the others. My memories on the rascally Scarlet are pretty thin, but I think Geary did more than Grimes, who probably was better than memory holds. Elliott, however, edges Grimes in that his Scarlet seemed to be an actual friend of the ageing Robin even if I find his casting a bit odd. The 1967 and 1952 versions were neither memorable or horrible, but we then descend to some awful performances. It's amazing that Christian Slater was held as the 'appeal to the youth', and his efforts at an English accent should be more mocked than Costner's failure to even try. However, Poretta ranks lower because he did nothing. He was given this silly name of Will Scarlet O'Hara (who is from Georgia) and then that's pretty much it. Dornan was just a disaster. He cannot act, or at least I have yet to see him give an actual performance. Granted, I've seen him only in those awful Fifty Shades films, but he is a major reason for why they are so awful. Sure, I suppose he has a nice body though in Robin Hood he can't show it off. He cannot show any emotion and to top that off, for reasons unknown his Will (Scarlet) Tillman is set up to be a villain in the sequel that will never come. It's just cringe-inducing. The 1967 A Challenge for Robin Hood and 2018's Robin Hood are the only versions to exclude King Richard I from the screen. In a surprising turn, Wallace Beery's more merry monarch tops this list, especially since Beery was not known for a jolly manner. His Richard could be harsh, but on the whole he was the noble Lion-Heart we all know and love. Hunter keeps to this tradition, though he also keeps to the tradition of being a smaller part of the story. Connery and Ustinov essentially made cameos, with the former causing laughter at the Robin Hood: Prince of Thieves screening. At least he had a purpose, which Ustinov didn't. As a side note, Connery is the only actor to appear in two different roles in Robin Hood films: the older Robin in Robin and Marian and King Richard in Prince of Thieves. I do not remember Barr, and Stewart was just there to spoof Connery. Huston and Harris are from the new tradition of making Richard I a villain, an evil character. We saw this in Robin and Marian where Richard committed war crimes, something that the dark Robin Hood of 2010 kept. Harris however gets voted the worst because he was just so hammy. Our wicked John Lackland has failed to appear on three occasions: 1967's A Challenge for Robin Hood, 1991's Robin Hood: Prince of Thieves and 2018's Robin Hood. Most often it is because the Sheriff takes on the primary villain role. However, The Adventures of Robin Hood is perfectly able to balance the three villains (Prince John, the Sheriff of Nottingham and Sir Guy of Gisbourne) by giving each distinctive personalities. I don't think there has been a better version than Claude Rains, who remains my favorite actor of all time. He is shrewd and camp at the same time, a bit fey but no less dangerous. Claude Rains is just the best in anything he does. Take that as a standing recommendation. Ustinov made Prince John into a totally comic and inept figure, which is what the role required. His hissy fits, his Mommy fixation all work to make Prince John the inept foil to our fox. De Grasse was more villainous than normal, but without the ability Rains had. I don't remember Gregg and I cut Lewis some slack in that he was meant to be comic. Poor Isaac was nothing in 2010's Robin Hood and did nothing except scream and show off how fit he was. Holm ranks at the bottom only because he was basically a cameo. Our balladeer Alan-a-Dale is the most disposable of our Disposable Merry Men. He has been absent in a record five of the ten Robin Hood films in this retrospective, not appearing in 1938, 1976, 1991, 1993 and the most recent version in 2018. Out of all his appearances, the best one was done by an animated rooster. It helps when the balladeer is the legendary Roger Miller, who brings his country charms to our kid-friendly version. He also has three songs, all of which are effective. While most love Oo-De-Lally and Whistle Stop (both quite charming), his Not in Nottingham is quite dark and sad, perfect for the mood. I genuinely cannot remember the others save for Hayes, and I remember him for being so horribly annoying I wanted to smash his lute over his head. We have come to the end of our Robin Hood Retrospective, at least for now. I may find other Robin Hood films and integrate them later, and despite common sense I figure we'll get another Robin Hood film within my lifetime. If so, it will dutifully be added, but no matter what I do not see any other version coming close to overtaking 1938's The Adventures of Robin Hood as the standard to which all other Robin Hoods are measured.